Why does my Power button work sometimes? I have a Samsung Galaxy Note 2 from Verizon. A few nights ago I put it on my window sill and it sat in a very shallow puddle of condensation from my window air conditioner unit. I immediately put it in rice for 48 hours. The problem that I'm having is that the power button is responsive sometimes. Most of the time the button doesn't work at all. I opened up the unit and took a look. There is no noticeable moisture inside of it at all. Just to cover my bases, I removed the power button and reinstalled it. I also briefly ran a hair dryer over on low heat to try and evaporate any remaining moisture that I might have missed. My issue still seems to be the same. It will just randomly turn on and then will seem normal for about 30 minutes (button fully works). Then the power button will just stop working. Does this sound like something shorted out on the mainboard, or is there something else that I can try? There might be "JUST ENOUGH" corrosion in it to make it act this way. My Galaxy S2 Skyrocket also does this but mine only stops working occasionally. I dropped mine in a bowl of cereal (please don't ask) and have it's had some hard landings at work onto some big drills without a case on. Sometimes if I give my phone a smack on the back it'll work again normally. Not too hard, but it helps. I recently experienced the same issue after getting caught in the rain. A few droplets must have entered the casing, because soon my power button started acting up. At first, it would work intermittently. Sometimes I would even see the phone screen flashing on and off, as if the power button was continuously short-circuiting. Eventually it stopped working altogether. This wasn't much of an issue because I could turn on the screen by pressing the Home button, and turn it off using a widget I downloaded and placed on my home screen. But like an idiot, last week I shut down the phone for whatever reason. Now I can't turn it back on... because the power button doesn't work. Stupid. I opened up the phone and as soon as I touched the power button (the part that actually goes click-click), it literally fell off of the ribbon. I guess the connections must have rusted through. I have ordered a replacement part. Fingers crossed. I was having the exact same problem. The power button was flush with the phone bezel and it was extremely hard to power on. You would have to press the button very hard and sometimes press against a desk's edge to power it on. My note 2 has a small screen crack just below the home button and is still under warranty. 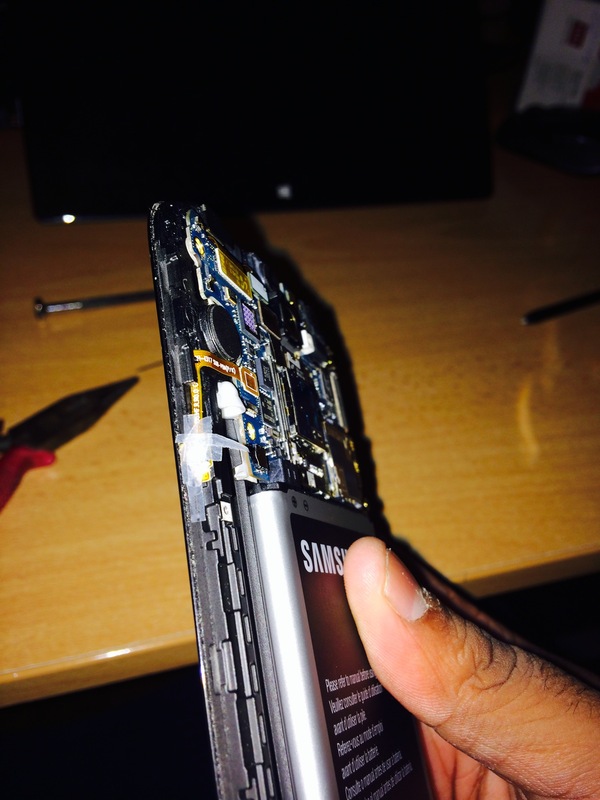 I decided to send it to Samsung for repairs asking only to fix the power button not the small less than half inch screen crack. They declined to fix it because a screen crack voids warranty. They had to phone for 3 weeks before sending it back to me. Ridiculous. I followed the instructions from this video:http://www.youtube.com/watch?v=UT-2zrZ_a... to take out the screws and take out the mid plate. I've never fixed a phone like this before so I watched it over and over again. I didn't have the blue plastic tool to take out the clips so I used my student ID card to make an opening and used a credit card and ran it along to the edge to pry open the clips. Used the same method to open the two clips battery is, except on one side I used the flat screwdriver just like the guy explaining in the video. Its because 3 pieces aren't aligned properly your power button is not working properly. The brown pieces has to be sandwiched between the two silver pieces (make sure all three are centered) and the black thing has to be facing towards to power ribbon not the button on the mid plate. Once all three are stacked on top the power ribbon cable side I taped with small strips of 3M tape to hold it together. It took about an hour to put this section together. Test it. Press the whole thing and you should feel the brown piece with the black pointy thing clicking...at this point your phone should power on. Next just slide the mid plate back into the phone and once you hear the clicks that means the clips are in and sealed. Watch the guy's video...he explains it very well. Put the screws back and you are done. You can try and replace the power button ribbon but not sure if it comes with the three small pieces. I definitely saved at least a $100 rather than going to store and getting it fixed. I really hope this works, if so, thank you, i'll try later today. check to see if you have downloaded any recent apps that may conflict with or could cause trouble... I'm having the same trouble, when i press my power button on my note 4 to wake my phone , nothing happens, i have to press it like 5 times... it just started happening and i hadn't dropped , damaged, no water , nothing, i started uninstalling apps one by one in reverse order and it turned out to be a generic galaxy note 3 lock screen i downloaded for my note 4 that started causing the issues... best of luck.